Hello everyone, This is my second post for today. My first post is here! The gorgeous Tracey McNeely organises 25 Days of christmas Tags every year. I have been a participant for past couple of years or more! Every day in the month of November there are some gorgeous tags made by some of the talented designers and each day there are prizes to be won from some wonderful sponsors as you can see below. Today I am participating as Simon Says Stamp designer. simon Says Stamp is offering one lucky winner $50 gift certificate. Here is my tag for 25 Days of Christmas Tags! 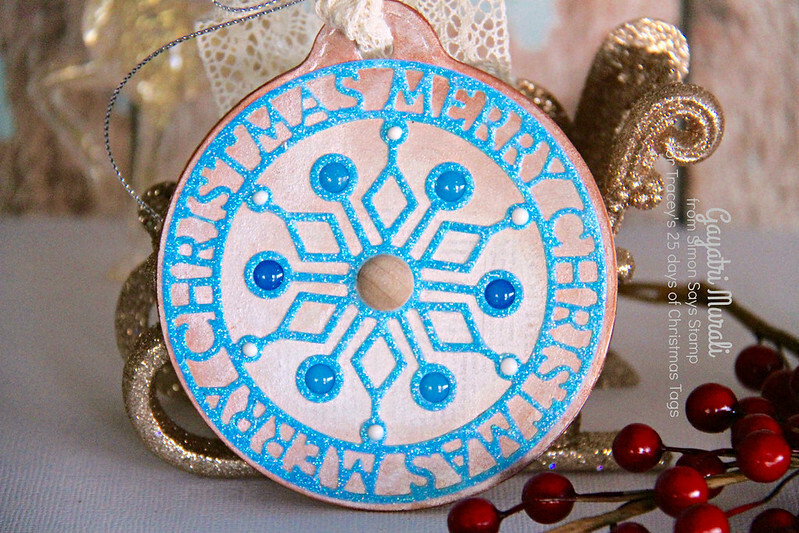 I have used Simon Says Stamp Christmas Token die to make this tag. The background is created using the largest of the Taylored Expressions Stitched Tag stacklets 3 die set. I die cut one using a script pattern paper and another using chipboard. I adhered the pattern paper on top of the chipboard. I applied Nuvo Silver and Fresh Copper mousse to get the shimmery muted look on the background. On a piece of scrap paper, I applied a generous amount of Nuvo Sapphire Blue glimmer paste. I let the paste dry and die cut the paper using Christmas Token die. I had to run this die like ten times on my die cutting machine to get a good cut. I adhered this on the tag base. I used Nuvo white crystal drops to fill in the small gaps of the snowflakes. 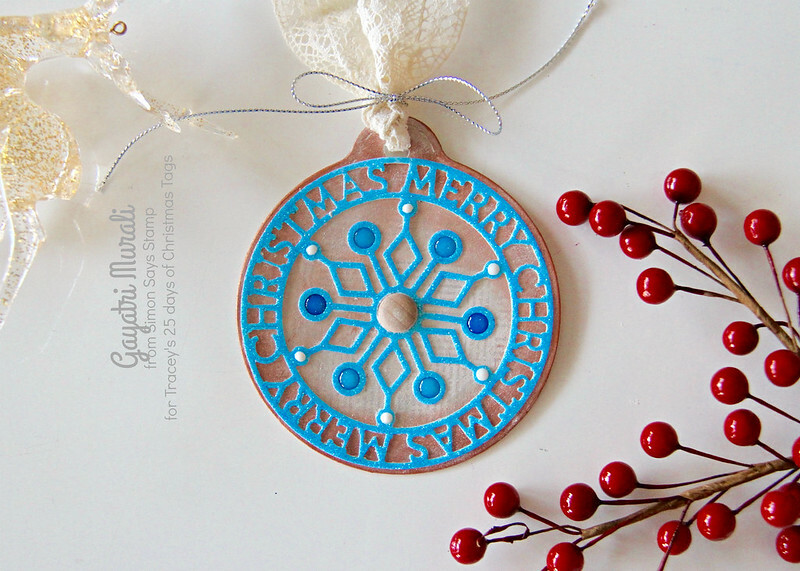 And Doodlebug Sprinkles enamel dots and wooden enamel dots on the rest of the snowflakes. I then tied a lace on the tag with a bow using silver twine from May Arts. 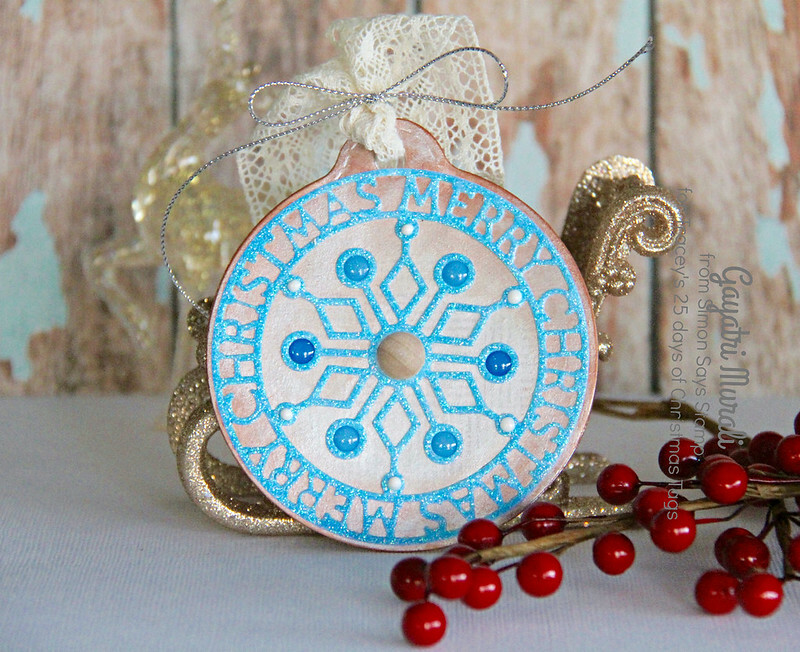 Simple, quick and easy tag which can also be used as an ornament. Thanks for stopping by again today! Have a wonderful weekend! Very unique & lovely tag. Absolutely beautiful, Gayatri! I love the color combination too! Gorgeous! Great looking ornament tag. Wonderful tag, love all the sparkle and shine with the wood. This is stunning, Gayatri!! Love the blue color!! The sparkle is just beautiful! !